Coffee Filter Crafts | Coffee Filter Wreath | Happy Deal - Happy Day! 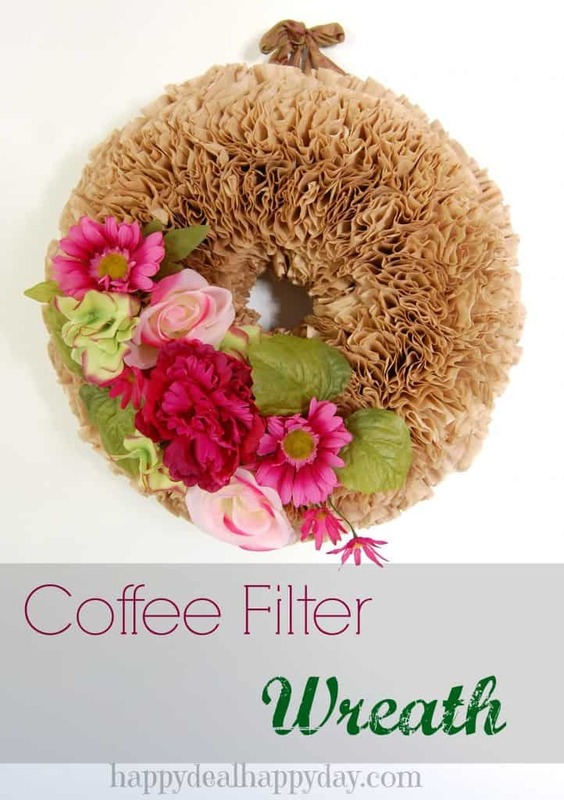 If you are looking for something creative to do with coffee filters, you should try making one of these coffee filter wreaths! It was very easy!! A bit time consuming, but very easy. 1. Cut about 2 feet of ribbon and tie it around the styrofoam ring. Tie another loop and finish with a bow. This will be what you use to hang your wreath with. You need this done first, because you will have the ribbon covered eventually by the coffee filters, but you will still have the end available for hanging. 2. 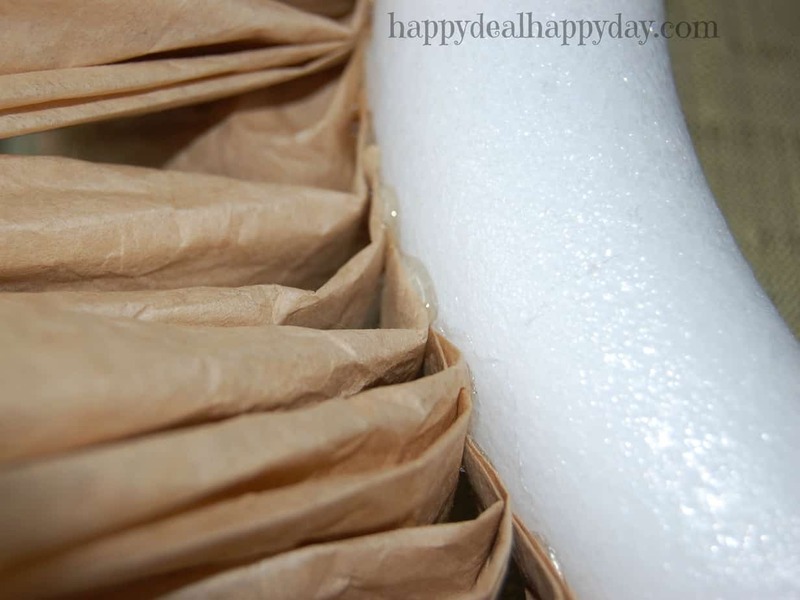 Take one coffee filter, and crumple it up to remove the pre-molded wave shape in the filter. Flatten it, then fold it in half. Fold it in half again until you get a triangle with one rounded end. Then fluff out the ends so that it has a petal like feel to it. 2. Glue on each of these coffee filters (I used up almost the entire pack!) in a pattern. I started a row around the very edge of the Styrofoam ring. I just glued the tip on the bottom in a row, as you see above. Then I did a row on the very inside of the ring. That left 2 more rows needed on the side. I did not cover the back as that part will be against the wall, and filters are not needed there. I also did not do this all in one day. It is a bit time consuming gluing each of these on, and having to wait a bit for the hot glue to cool in between filters. 3. When I finished covering the ring, I fluffed the filters so that it looked uniform. 4. Cut silk flowers with about 5 inches of their wire stem left. You can just insert the wire stems right into the Styrofoam and design the flowers how you choose! I didn’t glue them – but you could for extra security. 5. Hang, enjoy, and wow your friends as they will never guess this was made out of coffee filters! Gorgeous!!! I love it, Maura!! Thank you so much for attending week 8 of #PureBlogLove and linking your fantastic blog post. What a fantastic idea! This looks great. I can’t wait to see what you have in store for our party next week Thursday 8 PM EST- Sundays at midnight. Your post has been added to the #PureBlogLove Pinterest board for all to see 🙂 Have a great day! 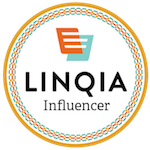 Linda, beautiful, congratulations. I would like to know the size of the styrofoam wreath. 14″ or 16″ will work! Thanks for asking this – I should have put this info in the materials list, so I just updated it!